If there’s one thing about paprika that Anita Molnár wishes more people knew, it’s that we owe Hungarian food to women. In fact, she’ll tell you, we owe every goulash, every fish soup and every chicken paprikash to one very particular group of 19th century women from the small village of Szeged, Hungary. If it hadn’t been for them, none of the Hungarian dishes we love would even remotely resemble the subtly sweet flavor profiles we recognize today. Instead, they would be hot, pungent replicas, burning with the heat of raw paprika pods. Molnár is now a descendant of these women, a paprika farmer and woman of Szeged herself, who spends her days drying and milling thousands upon thousands of those pepper pods. In the mid-1800s, Szeged probably didn’t look much different than it does today: rolling green hills, rows and rows of crops, little houses with triangle-shaped roofs and lots of cows and horses roaming the landscape. Today, it’s very much the same, despite a few crumbling buildings and abandoned factories, uneasy evidence of communism and a life dictated by the state. Visitors come to Szeged looking for the roots of this luminescent spice that has been embraced in dishes across the globe, from the United States to Thailand. What they might not know is that paprika didn’t actually originate here—sources say it originated in Central Mexico and brought to Spain in the 16th century—and didn’t become a major crop in Eastern European farmlands until the 19th century. Molnár’s parents started the Paprika Molnár farm in the heart of Szeged nearly 200 years later, in the beginning of the 1990s, at a time when starting one’s own business wasn’t exactly as easy as putting in an application for a loan from a bank. “What you need to understand,” Molnár told me, “is that Hungary was in the middle of a bloody and difficult transition from communism to capitalism, struggling to understand how to transition from state-owned cooperatives to privately-owned land.” The 1990s as we understand them here—a decade of economic prosperity and rapid GDP increase—was not the 1990s in post-Communist Szeged. Unlike many people who found themselves out of work after the fall, Molnár’s parents were a well-suited team to try their hands at creating a new business. Her mom, who had worked for the state, knew enough about finances and the banking sector to take on the administrative duties, and her dad, an agricultural worker, had 20 years of experience handling paprika and other crops like corn, wheat, garlic, onion and sunflower. They thought about what kind of crop would make for a good farming endeavor, decided on paprika and began the planting the seeds for what would become Paprika Molnár, their namesake and farm. At first, her dad grew some paprika plants on leased land, biding his time until he could build and manage his own mill and dehydrating plant. Her mom did all of the accounting and administration, all the while juggling full-time jobs at a local bank and in the financial sector. As goes much of life, they did good work, and then they retired. After earning her degree in English and History and spending years teaching English and translating, Molnár came back to the farm. Today, nearly 10 years later, she owns and runs the entire operation by herself. She can’t even count the number of hats she wears, telling me that not only does she manage six employees (including her), she plans everything, oversees manufacturing, does HR, PR, marketing, sales, payments and billing, customer relations and any and everything else you could imagine. Her brother Daniel, who co-owns the business, doesn’t actually work there—he has his own business as a manufacturer of conveyor belts for industrial plants. He does, however, write poetry about paprika. In one recent work, he lovingly calls it a “healing elixir,” a “great wizard,” a “strong poison”—the true God of the stomach landscape. Today, the Molnár’s farm focuses nearly all of its attention on one thing: processing raw paprika. Though the family does own a few small hectares of land—they grow two or three local sweet varieties and one hot one (the sweet strands being Szegedi-80, Bolero, and Mihálytelki, and the hot one being Szegedi 178). These numbers mean little to most people, but to Molnár, they are everything. Inside the drying plant, Molnár dries nearly 100 tons of paprika. “This is the weight of the end product,” she says. “In terms of raw produce this weight would be seven times more, which means seven kilograms of raw paprika makes one kilogram of spice.” They dry most of this for their own operation, but she does tell me that they also offer drying and milling services for farmers who also produce paprika spice. She starts this process at the end of summer, when all of the paprika is ready to harvest and be dried. She adds one more thing to her list of things she wished people knew about paprika. 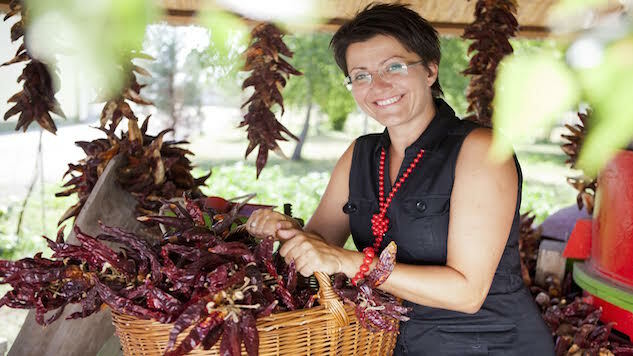 “The paprika that became the symbol of Hungary is produced from special red varieties that are suitable for drying,” she says, explaining that the most suitable species for drying are also the ones with the lowest water content. These peppers are the one that develop the reddest pigments during maturation time. What this means, she says, is that it’s the least juicy one of all. Kristin Winet is an award-winning travel writer, photographer, and teacher. Her travel writing, which has been featured both online and in print, focuses on the intersections of culture, gender, and food. She is also Assistant Professor of English at Rollins College in Winter Park, Florida. Check out her blog at www.bontouriste.com.